All of C&C Sutlery's trousers can be customized to meet your needs. In many cases, we can duplicate trousers from a picture. If the options below don't meet your needs, call us to discuss your specific customization. All Trousers with the exception of STANDARD Colors, Styles, and Sizes as listed below are custom made specifically for you and are subject to a restocking fee. 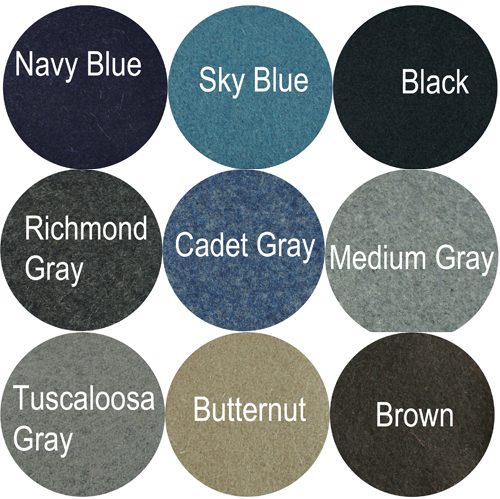 STANDARD TROUSERS: Foot or Mounted Size 34-42, Side Seam Pocket, No Rank Stripe or Cording Trim, Sky Blue, Navy Blue (Foot Trouser Only), or Medium Grey Wool; All Budget-line Trousers. The C&C Sutlery CS Foot Trouser is made of Melton wool with cotton facings and pockets. The button fly is lined with cotton to make it more flexible for buttoning. The adjustable "V" back on the waistband has eyelet holes for a tie to allow for waist adjustment. There is a dart on the back of each side that makes the trousers taper into the waistband. The trousers have a watch pocket and Side Seam or Mule Ear pockets. Fly buttons and suspender buttons are pewter. Inseam measurement is not needed as the trousers are unhemmed and can be either rolled up, cut off, or hemmed by the customer. The C&C Sutlery CS Foot Trouser with Enlisted rank stripe is made of Melton wool with cotton facings and pockets. The button fly is lined with cotton to make it more flexible for buttoning. The adjustable "V" back on the waistband has eyelet holes for a tie to allow for waist adjustment. There is a dart on the back of each side that makes the trousers taper into the waistband. The trousers have a watch pocket and side seam or Mule Ear pockets. Fly buttons and suspender buttons are pewter. Inseam measurement is not needed as the trousers are unhemmed and can be either rolled up, cut off, or hemmed by the customer. The C&C Sutlery CS Foot Trouser is made of Jean Wool with cotton facings and pockets. The button fly is lined with cotton to make it more flexible for buttoning. The adjustable "V" back on the waistband has eyelet holes for a tie to allow for waist adjustment. There is a dart on the back of each side that makes the trousers taper into the waistband. The trousers have a watch pocket and side seam or Mule Ear pockets. Fly buttons and suspender buttons are pewter. 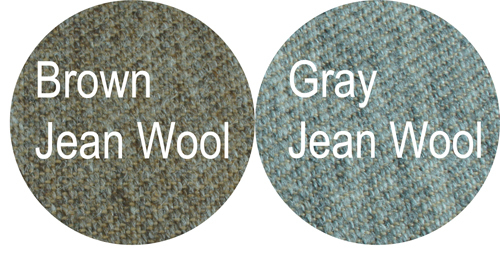 Choose either Brown or Gray Jean Wool. The C&C Sutlery CS Foot Trouser with Enlisted Rank Stripe is made of Jean Wool with cotton facings and pockets. The button fly is lined with cotton to make it more flexible for buttoning. The adjustable "V" back on the waistband has eyelet holes for a tie to allow for waist adjustment. There is a dart on the back of each side that makes the trousers taper into the waistband. The trousers have a watch pocket and side seam or Mule Ear pockets. Fly buttons and suspender buttons are pewter. The C&C Sutlery CS Foot Officer's Trousers feature 1/8 inch branch of service cording down the outside seam of each leg. 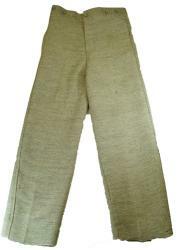 The trouser is made of Melton wool with cotton facings and pockets. The button fly is lined with cotton to make it more flexible for buttoning. The adjustable "V" back on the waistband has eyelet holes for a tie to allow for waist adjustment. There is a dart on the back of each side that makes the trousers taper into the waistband. The trousers have a watch pocket and side seam or Mule Ear pockets. Fly buttons and suspender buttons are pewter. Inseam measurement is not needed as the trousers are unhemmed and can be either rolled up, cut off, or hemmed by the customer. The C&C Sutlery CS Foot Officer's Trousers feature an 1/8 inch metallic gold cording down the outside seam of each leg. The button fly is lined with cotton to make it more flexible for buttoning. The adjustable "V" back on the waistband has eyelet holes for a tie to allow for waist adjustment. There is a dart on the back of each side that makes the trousers taper into the waistband. The trousers have a watch pocket and side seam or Mule Ear pockets. Fly buttons and suspender buttons are pewter. Inseam measurement is not needed as the trousers are unhemmed and can be either rolled up, cut off, or hemmed by the customer. 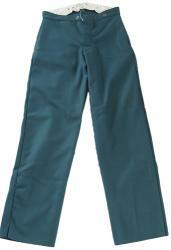 The C&C Sutlery CS Mounted Trouser is made of Melton wool with cotton facings and pockets. 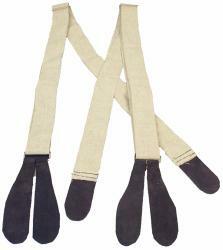 The mounted trouser has a reinforced seat and leg. The button fly is lined with cotton to make it more flexible for buttoning. The adjustable "V" back on the waistband has eyelet holes for a tie to allow for waist adjustment. There is a dart on the back of each side that makes the trousers taper into the waistband. The trousers have a watch pocket and side seam or Mule Ear pockets. Fly buttons and suspender buttons are pewter. Inseam measurement is not needed as the trousers are unhemmed and can be either rolled up, cut off, or hemmed by the customer. 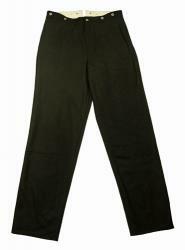 The C&C Sutlery CS Mounted Trousers with Enlisted rank stripe is made of Melton wool with cotton facings and pockets. The mounted trouser has a reinforced seat and leg. The button fly is lined with cotton to make it more flexible for buttoning. The adjustable "V" back on the waistband has eyelet holes for a tie to allow for waist adjustment. There is a dart on the back of each side that makes the trousers taper into the waistband. The trousers have a watch pocket and side seam or Mule Ear pockets. Fly buttons and suspender buttons are pewter. Inseam measurement is not needed as the trousers are unhemmed and can be either rolled up, cut off, or hemmed by the customer. 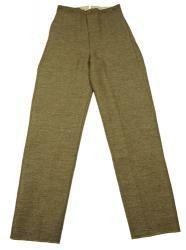 The CS mounted trouser is made of Jean Wool with cotton facings and pockets. 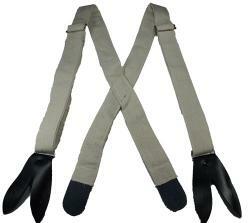 The mounted trouser has a reinforced seat and leg. The button fly is lined with cotton to make it more flexible for buttoning. The adjustable "V" back on the waistband has eyelet holes for a tie to allow for waist adjustment. There is a dart on the back of each side that makes the trousers taper into the waistband. The trousers have a watch pocket and side seam or Mule Ear pockets. Fly buttons and suspender buttons are pewter. The C&C Sutlery CS Mounted Officer's Trousers feature 1/8 inch branch of service cording down the outside seam of each leg. 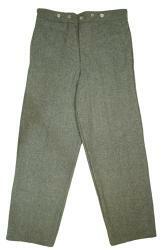 The trouser is made of Melton wool with cotton facings and pockets. The mounted trouser has a reinforced seat and leg. The button fly is lined with cotton to make it more flexible for buttoning. The adjustable "V" back on the waistband has eyelet holes for a tie to allow for waist adjustment. There is a dart on the back of each side that makes the trousers taper into the waistband. The trousers have a watch pocket and side seam or Mule Ear pockets. Fly buttons and suspender buttons are pewter. Inseam measurement is not needed as the trousers are unhemmed and can be either rolled up, cut off, or hemmed by the customer. The C&C Sutlery CS Mounted Officers's Trousers feature an 1/8 inch metallic gold cording down the outside seam of each leg. The mounted trouser has a reinforced seat and leg. The button fly is lined with cotton to make it more flexible for buttoning. The adjustable "V" back on the waistband has eyelet holes for a tie to allow for waist adjustment. There is a dart on the back of each side that makes the trousers taper into the waistband. The trousers have a watch pocket and side seam or Mule Ear pockets. Fly buttons and suspender buttons are pewter. Inseam measurement is not needed as the trousers are unhemmed and can be either rolled up, cut off, or hemmed by the customer.